We decided to stop by the fish market as a pre-dinner snack and to see the types of seafood sold at the market. 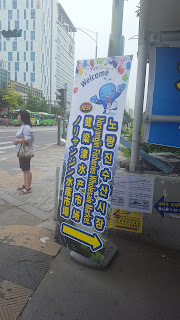 We took Line 1 to Noryangjin Station, and from there, simply followed the signs to the closest exit. Once you get out of the train station, walk toward the right side and keep going until you see the underpass that leads into the fish market. Once you're inside, thats when numerous ahjummas and ahjussis start persuading you to buy their seafood. Tanks are filled with live abalone, squid, a huge variety of fish, octopus, etc. We settled for 3 small octopus that cost 10,000 won total. Upstairs is the seating area where you can bring the fresh seafood and they'll prepare it and serve it to you for a table fee of 3,000 won. 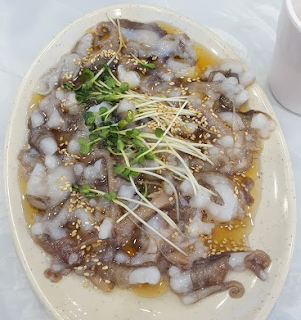 Live octopus (산낙지 sannakji) is very intimidating at first because it is served to you, with the tentacle muscles still working. Each piece continues to squirm around on the plate before your eyes. Honestly, it doesn't taste like much other than the sesame oil that its coated in to reduce the suction. For me, I wasn't a fan of the texture--it was very chewy, not to the point where it was rubbery, but it was hard to swallow for me. The nightmares of getting octopus stuck in your throat and dying from it is more of a myth. As long as you chew it well, it won't kill you. I would come again and get raw fish (회 hoe) though. As for the octopus, great as a once a lifetime thing, but not something I would go for again. It's really an acquired taste.